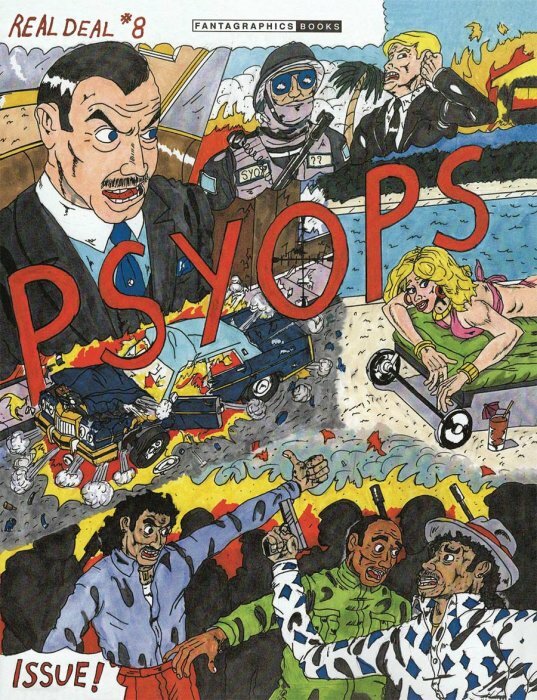 From 1990 to present there has been an underground comic published off-and-on titled, "Real Deal Comix." Created by Lawrence Hubbard (AKA, "Rawdog,") and H.P. McElwee (AKA R.D. Bone) they both took the money they had from their jobs to put-out a periodical absurdly over-the-top and full of what they described as, "Urban Terror." McElwee Sadly passed away at the age of 43 due to a stroke followed by a heart attack in the 1990's but Hubbard has continued the comic with a variety of contributors too. Just what is, "Real Deal Comix," and what is, "Urban Terror," at that? In the first issue Hubbard and McElwee said, "Urban Terror," was in essence a reflection of the complexities and difficulties of inter-city life boiled down to pure wild violence. Everyday events such as getting some fast food or relaxing over drinks at a bar suddenly erupt into a, "Massacre," of everyone punching, stabbing, and shooting. The comic often will focus on the character of, "G.C.," a large and anger-prone pimp who will just as quickly give a friend a hug as curb-stomp a homeless person who irritates him. 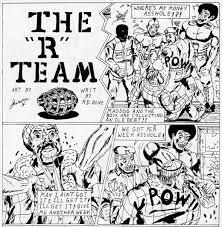 Earlier issues also had a twisted version of The "A" Team called instead, The "R" Team who operate like a uber-violent and twisted version of that popular crew. 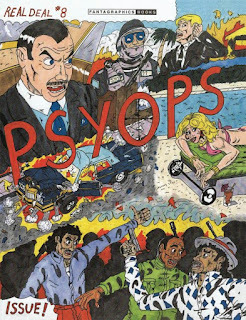 I was able to read the first seven issues by purchasing a big Fantagraphics hardcover reprinting them and picked-up the most recent release of issue #8--now published by Fantagraphics as opposed to its underground days. They hit you right in face with the brutality expressed by these characters with caricature-ish faces yet realistic bodies (something Hubbard said he focuses on doing in his drawing in an interview I read within the hardcover). The vignettes we witness drawn by Hubbard (and initially written by McElwee) are full of foul language, anger, and everyone within the stories tends to be just an awful human. It is all done with a bit of a wink however and some super-dark humor. For an example of some immensely, "Wrong," humor, one of my favorite bits is when at the end of G.C. 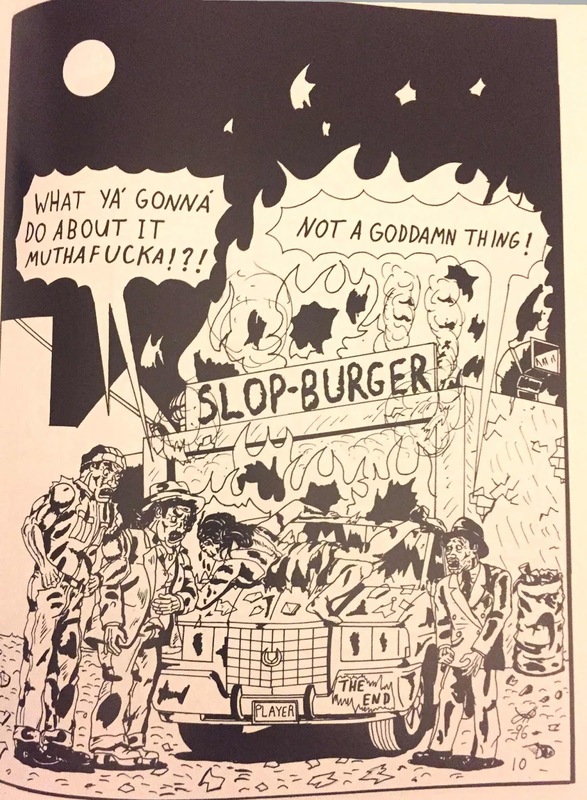 and a friend totally wrecking a, "Slop-burger," with their fighting they throw someone's dead body upon a car. A man declares how that was his his new vehicle and is asked what he thinks he's going to do about it. We get a spread of the burning Slop-burger and him simply responding, "Not a Goddamn thing," knowing any cross word could easily get him killed. "Real Deal Comix," is not a pleasant or easy read. It is full of horrific slurs, extreme violence, and is just incredibly nasty. It is doing this to illustrate a clever self-aware point however about how for all the ways we try to act polite and civilized we as a society often are on a razor's edge of it all falling apart and everyone just fighting and killing each other--think Thomas Hobbes', "Leviathan," and his statements about life being, "Nasty, brutish, and short," if not for humankind agreeing to try and be orderly instead of living in anarchic chaos. 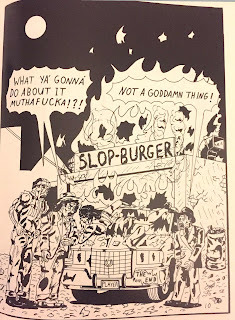 Well, in "Real Deal Comix," anarchic chaos is the deal of the day and for many people life is a nasty and brutish as it can get, and very short. These sociopolitical ideas actually are further touched upon in the newest issue #8 where G.C. meets a mysterious individual who informs G.C. he's been working to get rich off of the violence and mayhem caused by our protagonist and laughing all the way to the bank whilst the minority and impoverished individuals suffer. 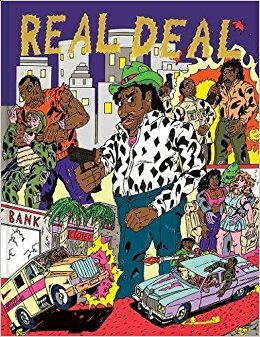 As is evident, beneath the over-the-top violence and mayhem lie some very insightful ideas within, "Real Deal Comix." Hubbard and the sadly-departed McElwee created something supremely weird and fascinating with, "Real Deal Comix," and Hubbard continues to keep things entertaining as he does the book with various collaborators. The, "Real Deal Comix," comic-books are not laid-back breezy reads, they are nasty and rough. They still are very clever and quite funny too though and worth checking-out if you're into comic-books with a bit more of a edge. You can buy the, "Real Deal Comix," hardcover as well as issue #8 at Fantagraphic's website and all finer comic shops.